O’Donnellan & Joyce has launched its Wild Atlantic Way spring property auction, the first in a series of seven property auctions for 2017. O’Donnellan & Joyce, the largest auction house outside Dublin, will have more than 35 properties going under the hammer in the March 3 auction. There will be properties for sale in this auction in all the counties on the Wild Atlantic Way from Limerick to Galway and all the way up to Donegal. Lovely bright two bedroom apartment located in a small complex of only six apartments in this quiet residential area of Oaklands, Salthill. The property is just a two minute walk to the centre of Salthill and all its amenities, as well as Salthill Promenade and a host of top class restaurants and leisure facilities. This would be an ideal holiday home or a superb investment property. Presented in excellent condition. AMV €175,000. Detached two bed property in need of modernisation and refurbishment. Located in a most desirable location in Barna village. Local hostelries include the famous Donnelly's of Barna bar and restaurant, O'Grady’s on the Pier, and The Twelve boutique hotel. Views from the property are breathtaking and, with proper planning and a good eye, one could take full advantage of these spectacular views. A once in a lifetime opportunity to acquire a property in this very desirable location. AMV €195,000. Bright and spacious three bedroom semidetached residence. Located within walking distance of Terryland Shopping Centre, schools, and church, this residence would be an ideal owner occupier home or a gilt-edged investment property. The property also benefits from off street parking, a good sized rear garden, and a side entrance. Viewing is highly recommended and guaranteed not to disappoint. AMV €210,000. Spectacular five bed family residence in village setting. Many extras include underfloor heating, handmade internal doors, large garden to front, side, and rear, cobbled driveway, alarm, hollow core flooring, PVC cedar finish windows, and a high standard of tiling. There is large external storage with previous planning suitable for townhouses. Accommodation comprises entrance hall, living room, dining room/gym, kitchen, conservatory, family room, five bedrooms, three en suite, bathroom, utility, and guest wc. AMV €275,000. Well known public house with old world charm. Seven day bar licence with seating for in excess of 50 patrons. Features include Liscannor paved stone flooring in bar, timber beam ceiling, and a feature fireplace. Fully equipped with sale to include all furniture, fixtures, and fittings. Ground floor includes living room, kitchen, and bathroom. Upstairs there are four bedrooms, all en suite and fully furnished. AMV €160,000. Detached spacious family home, currently in two apartments, located within a short commute of NUIG, UHG, and Galway city centre. Also ideally located within moments of a host of shops, schools, Salthill Promenade, and sporting facilities. This property would be an ideal starter home, retirement property, or a gilt edged investment property due to its convenient location. Viewing is highly recommended and guaranteed not to disappoint. AMV €145,000. Two bedroom apartment located within one mile of Eyre Square and within close proximity of NUIG, UHG, and Terryland Retail Park. The property is also located on an excellent transport network. Presented in turnkey condition, accommodation comprises hall, open plan kitchen/dining and lounge area, two double bedrooms, one en suite, and main bathroom. Electric storage heating, double glazed windows, and secure complex. An ideal investment opportunity, holiday home, or owner occupied residence. AMV €180,000. 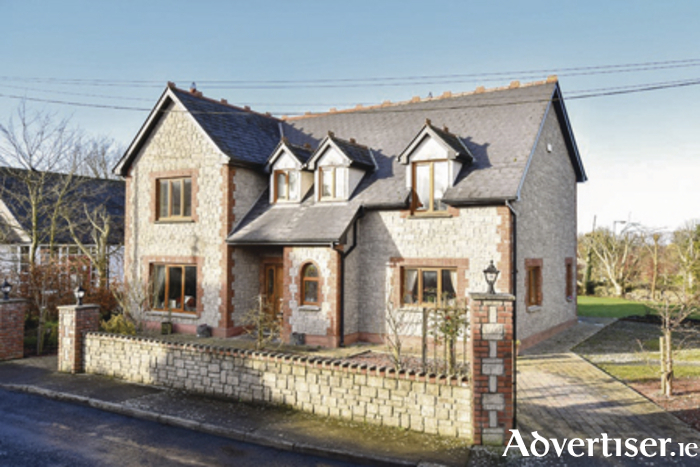 Charming three bedroom detached two storey family home in the heart of Corofin village, adjacent to St Coleman’s Church and opposite the GAA pitch. What more could you want for village centre living? Comprising approximately 1,150sq ft, this home is presented in excellent condition with quality finishes and comes to the market with garage and large rear garden. AMV €175,000. Newly constructed detached residence of circa 3,000sq ft, with garage to the rear. Located beside the fire station in the centre of Mountbellew. Previously had planning permission to construct a residential family home but is now currently divided to accommodate a commercial unit on the ground floor with apartments overhead (see planning ref 04/1091 ). An application was also submitted to divide the premises into two four-bed dwellings, planning ref 10/912. All interested parties are advised to carry out their own research in relation to the planning. AMV €55,000. Previously used as consulting rooms, a recent application was made for change of use to revert to private residence. Presented in excellent condition, this will make a superb home for someone looking to downsize. Offered with PVC double glazed windows and doors, storage heating, an open fireplace in the living room, and a lovely sun trap patio/garden to the rear. Within walking distance of Mount Carmel Abbey, Loughrea town centre, Loughrea Lake, and all local amenities. AMV €90,000. Grazing lands of approximately 1.9 acres, situated close to the Caherlavine roundabout on the edge of Loughrea town. AMV €20,000. Commercial unit in a very central location with office/apartment overhead. The retail unit is currently trading as a hairdressing salon and generating a rental income of €500 per month. The overhead office/apartment is currently vacant. AMV €50,000. Modern end of terrace three bed home in lovely condition, located just off the N17 in the scenic village of Milltown. Millbrook is a mixture of detached, semidetached, and terraced homes with some retail units. Nicely maintained, this residence comprises hall, living room, kitchen/dining, three bedrooms, and bathroom. Would make a lovely starter home or ideal for those who want to downsize. AMV €50,000.